The Obama recovery was looking a lot better on Friday after a particularly strong jobs report made 2014 the best year for hiring since 1999. But how does that compare to other presidents? Critics of the Obama administration say the economic recovery has taken too long and that the unemployment rate still hasn't fallen back to pre-recession levels. They argue the true unemployment rate is even higher than 5.8% because so many workers hadn't dropped out of the labor force altogether in the last six years. Obama's supporters see it differently. They point out the president took office during the worst economic downturn since the Great Depression and has managed to turn things around and get growth back on track. President Ronald Reagan was no stranger to recessions, either. The economy was just emerging from one when Reagan took office, and it quickly fell into a second recession early in his tenure. Double-digit inflation was the major problem at that time, something the Federal Reserve beat back by having interest rates in the teens. 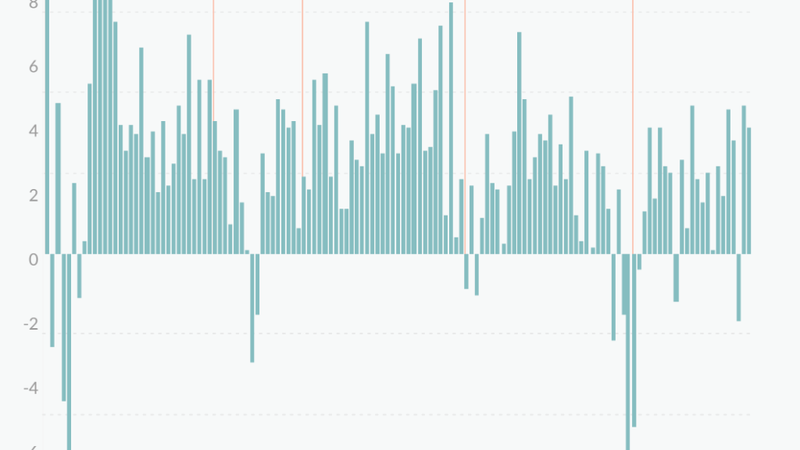 Once inflation was defeated and interest rates returned to normal, the economy took off. That rate of growth hasn't been matched since. There are many reasons the economy is different now -- everything from technological change to greater global competition, and it could be awhile before the U.S. hits that Reagan level of growth again, if ever. The recent president with the best economic record was Bill Clinton, who oversaw the addition of nearly 23 million jobs during his eight years in office. 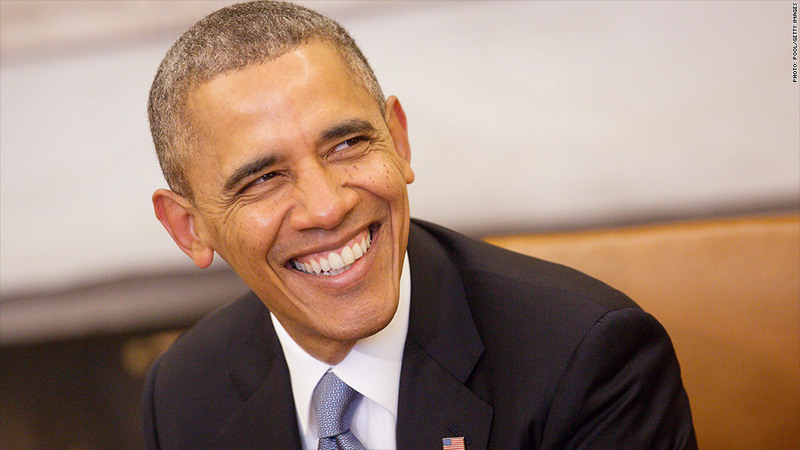 His reforms of tax and spending policies, which eliminated annual budget deficits, deserve some of the credit. But so do huge improvement in productivity that came from the widespread adoption of personal computers and the Internet during that time. Everything was growing, but as we have learned in hindsight, there was also a tech bubble building up that would come back to haunt future presidents. The bursting of the Internet stock bubble in 2000 led to a mild recession early in President George W. Bush's first term. The recession was soon over but job losses continued for more than a year, resulting in what was widely known as a jobless recovery for much of Bush's time in office. When jobs finally did come, many were due to a housing bubble that eventually brought on the Great Recession. 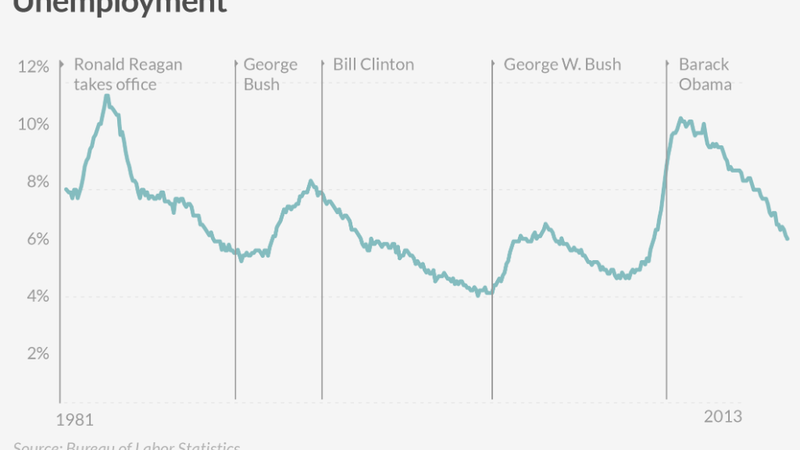 There has been far more hiring under Obama than under Bush. But gains in workers' paychecks are very limited, with median income basically stalling out during Obama's tenure. 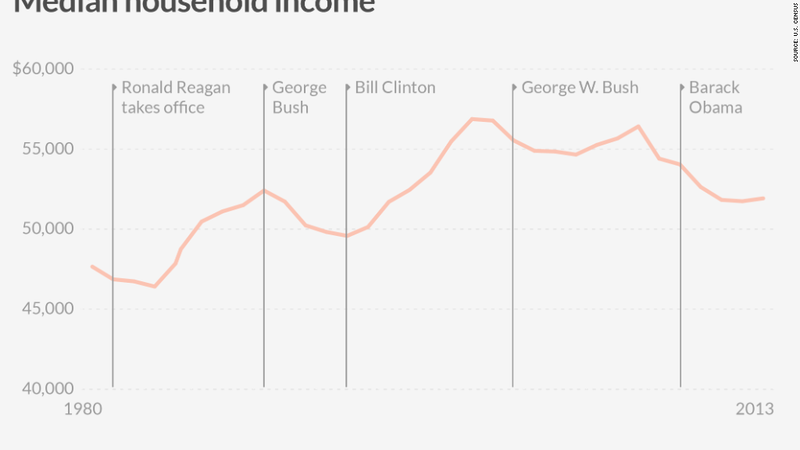 Today median income is on par with where it was in 1995, which is one of the reasons many Americans still don't feel the economy has truly improved.